Some of you know that I like to take photos of paths. The subject is not special, because you just take the photo on the way you go, but what I like is that there are tons of different possibilities how paths can look like. I don’t take these photos randomly, I take them when I think “I find it beautiful where I stand right now”. These photos also remind me of special hikes that I did. In fact when I look at the picture in this post, it reminds me of the sound of birds, the smell of meadows and so on. That’s what I like about it. [ Smiles ] Dennis, you were not joking about that being a beautiful path. This path looks so beautiful. 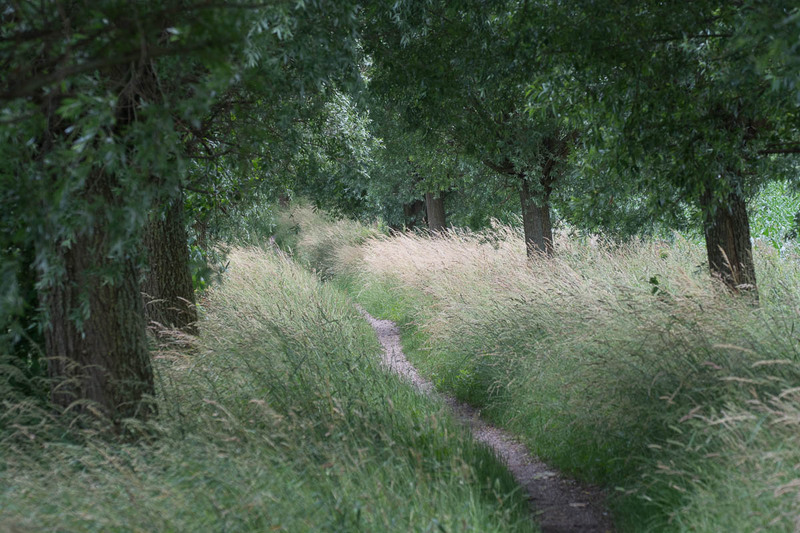 I would love to walk down it listening to some Keaton Henson or something, seems like it would be extremely therapeutic! That’s the way I see it. When I go hiking, I often can come down to earth… no pressure, no stress, not having to think about things. And then time slows down. And sometimes on my way, I just want to stand still and listening to the sounds of nature, or looking at the beautiful things around me. It’s definitely therapeutic. I think our modern life can be very stressful, but in these moments when I hike, all that disappears.